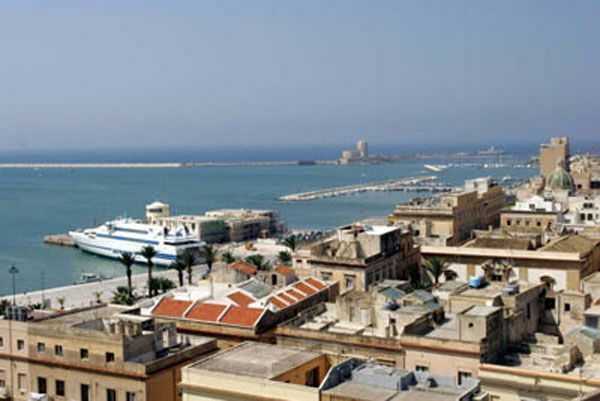 The beautiful city of Trapani, capital of the province of Trapani, sits on the west coast of Sicily. It is situated on a low headland sticking out into the Mediterranean Sea and is watched over by Erice nestled on Monte San Giuliano. 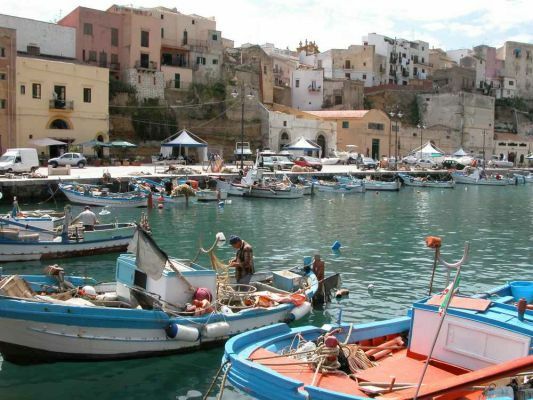 Since its real foundation by the Elymians it has served as a fishing port and the main way to reach the Egadi Islands. The sea has been, from the moment the city was created, the core source of Trapani’s economy. Fishing tuna, which abound in the area, and canning are vital industries. The city exports coral, salt, marble and Marsala wine. There are three versions as to the city origins. As to the mythical explanation, two legends aim to provide an answer to the way the city was created. According to the first legend, after Hades had kidnapped Persephone, her mother, the goddess Demeter, started a desperate search of her daughter. In her search her sickle fell from her hands and Trapani grew from it. The second legend reads as follows: the god of the sky, Saturn eviscerated his father Cronus with a sickle from which the city was born when it fell to the sea. It may be the reason why Saturn was its god guardian and the statue representing the Roman god is still in a central square. As to its historical origin, it reads that as the city formerly called Eryx (Erice today) inhabited by the Elymians needed a port, therefore this people founded it on the headland jutting out into the sea. The city‘s original name was the Greek word Drépanon whose translation reads sickle due to the shape of the harbour that curves out into the sea. The Phoenicians establishing commerce and settling in different areas of the Mediterranean coasts turned the city into an important trading centre. The city power was later held by the Carthaginians in 260 BC., who turned it into a base for their fleet and was later surrendered to Rome (241 BC) after the battle of the Aegates during the First Punic War. The city control was seized by different peoples: the Romans, the Vandals, the Byzantine Empire, the Arabs and conquered by Ruggero I the Normand. The Arabs gave the city a period of splendour as to architecture, agriculture, art and culture. Trapani played a key role as a port in the Mediterranean Sea during the Crusades. Plagues, revolts and famines during the 17th century plunged the city into darkness. Nevertheless, it saw its own rebirth when in the 18th century its population grew steadily and trade and military force stayed strong. The city strongly supported Italy’s reunification and was given a medal for participating in the revolts of 1848 by Umberto I . But the distance from markets was the reason why the city underwent a period of decline that lasted even up to the First World War. However, its cultural and political life remained alive and strong. The World War II brought a period of decay again as the city was frequently bombed by the Allied. Trapani was one on the most bombed towns in the country. During the war the district of San Pietro, the oldest part of Trapani and Garibaldi Theatre were destroyed and the population lived in the hardest conditions. Since the end of the war it has found its way to overcome it and industry and commerce have flourished again. Tourism has helped bring the city a new breath of life for cities such as Erice, Segesta and the Egadi Islands are so close. Its busy ferry port connects Egadi Islands, Pantelleria, Sardinia and Tunisia, and the city is home of the Trapani Birgi airport. Due to the continuous periods of decay, battles, sieges and bombardments the remains of the ancient city are scarce. The buildings that have stood over the centuries belong to the baroque period, the late medieval or early modern periods. 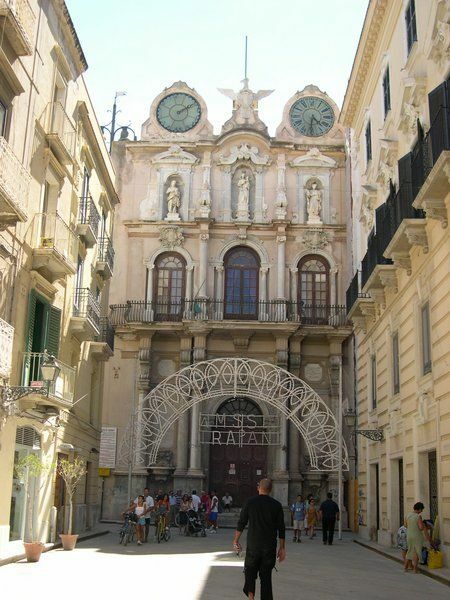 Sacred building that have been well preserved for centuries and deserve a visit are the Church of Sant'Agostino dating back to 14th century, the Sicilian baroque churches of Maria SS. dell'Intria and Badia Nuova and the cathedral that was built in 1421 and refurbished in 18th century by Giovanni Biagio Amico. It houses an Annunciation which supposedly was created by Anthony Van Dyck. The Triton's Fountain and the Baroque Palazzo della Giudecca or Casa Ciambra are two other monuments that cannot be missed. BY CAR: From Palermo: take the highway Palermo –Trapani called A 29 . BY TRAIN : From Palermo: take the train to Trapani, via Milo, some calling at Segesta.